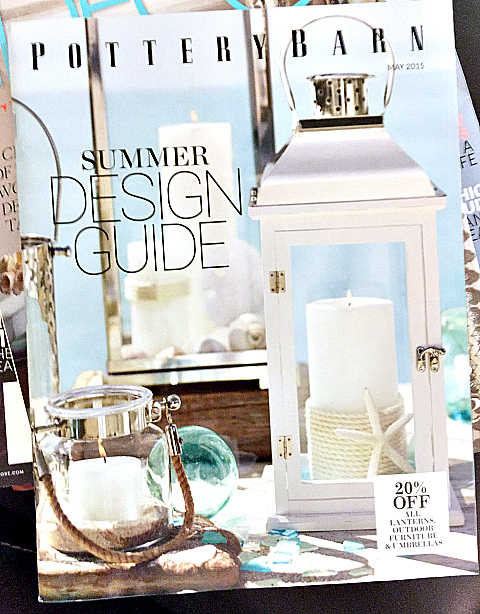 Home » Greeting Cards » Color Combination Inspiration, Day 2 Plus Lots of Good News! Color Combination Inspiration, Day 2 Plus Lots of Good News! Yesterday, I told you how I “think in Stampin’ Up!” language. The inspiration for that card came from my daughter’s apartment décor. Today’s card inspiration comes from the colors in her bedroom here at home. (How long do I keep an official bedroom for her at home? This empty-nester stuff is still new to me.) 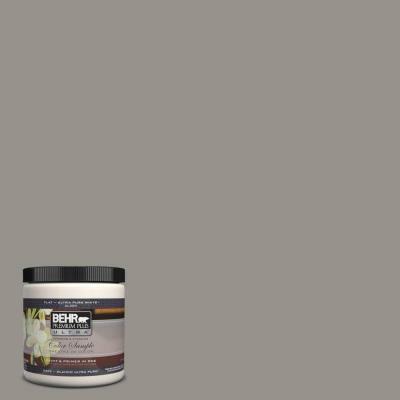 Her room is painted in Behr’s Elephant Skin and Behr’s Harmonious paint colors. For my card, I used Smoky Slate and Soft Sky. 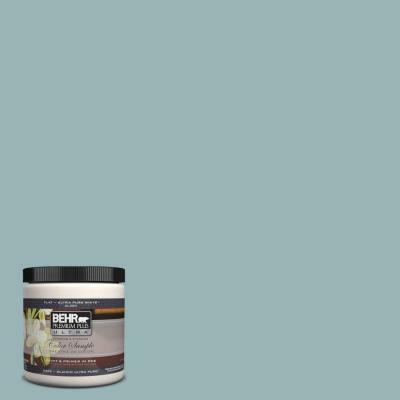 Whenever a new catalog and new In-Colors come out, I always feel a little sad for the tried and true oldies but goodies, and Soft Sky is one of those colors. I don’t use it very often, but it is absolutely beautiful when it is used along with Smoky Slate and when silver ribbon, metallic thread, sequins and rhinestones area added to the mix. The colors make this card so calming. I think I stumbled upon a new favorite combo! What do you think? 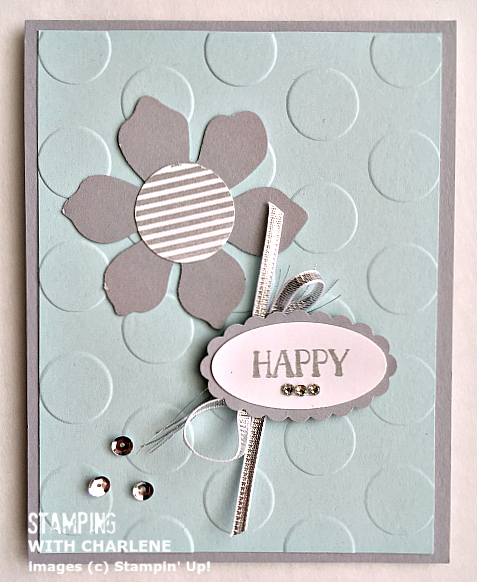 In addition to providing you with some stamping inspiration, today I also get to share with you news of new Stampin Up! special promotions! Be sure to check out the Clearance Rack! New items were added today and are available while supplies last. As if new Clearance Rack items weren’t enough, be sure to check out this week’s Weekly Deals! 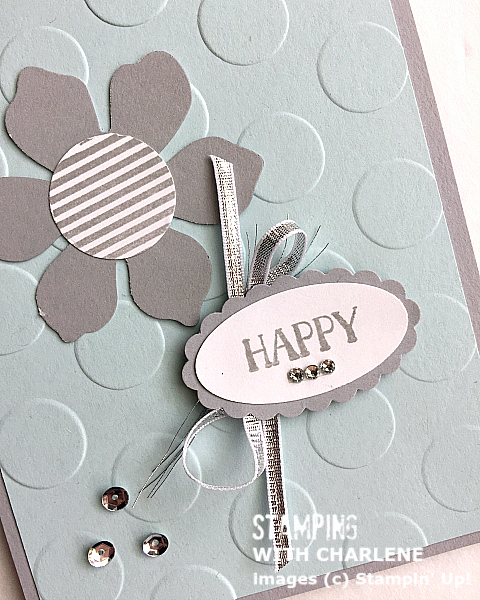 The FUN FLOWER PUNCH that I used to punch the cute flower for this card is on the list. Amazing!!! !